This type of kale goes by many names: lacinato kale, dinosaur kale, black-leaf kale, and Tuscan kale. In fact it is most prevalent in Tuscany, and in Italian it's called cavolo nero (literally: "black cabbage"). I personally think it is the best type of kale that there is -- its leaves are more tender and flavorful than other types, sweeter and less bitter. It's easier to cook than curly-leaf Russian kale, and it's packed with nutrients. Cavolo Nero is a leafy type of cabbage that doesn't form round, compact heads, but rather resembles palm fronds, with very dark green, almost black, leaves that can be up to a yard (a meter) long, have pronounced ribs, and whose surfaces have a distinctive ruffled appearance. One cup of Tuscan kale contains considerably more than 50 percent of the minimum recommended daily allowances of vitamins K, A, and C, with lesser but still significant amounts of manganese, copper, fiber, calcium, iron, B vitamins, vitamin E, and many other nutrients. It is also rich in antioxidants and is thought to help prevent a variety of health problems, ranging from stomach, colon and bladder cancer to ulcerative colitis. Finally, it's both filling and low in calories, just 19 to 26 calories per 100 grams (1/4 pound), which leads Italian doctors to recommend it to those who want to lose weight. In Italy, Tuscan kale is generally labeled cavolo nero, though you can also find it identified as cavolo toscano, cavolo palmizio, or cavolo a penna, while agricultural treatises mention specific cultivars, for example cavolo nero fiorentino, cavolo riccio nero di toscana, and cavolo riccio nero di Lucca. It is an essential ingredient in many classic Tuscan recipes, such as ribollita. In the U.S., you might have better luck finding it in a farmer's market or an organic produce market than in a larger, less-specialized market, though I have seen it many times in Trader Joe's. If you simply cannot find it, seeds are readily available on the Internet, and it is easy to grow. 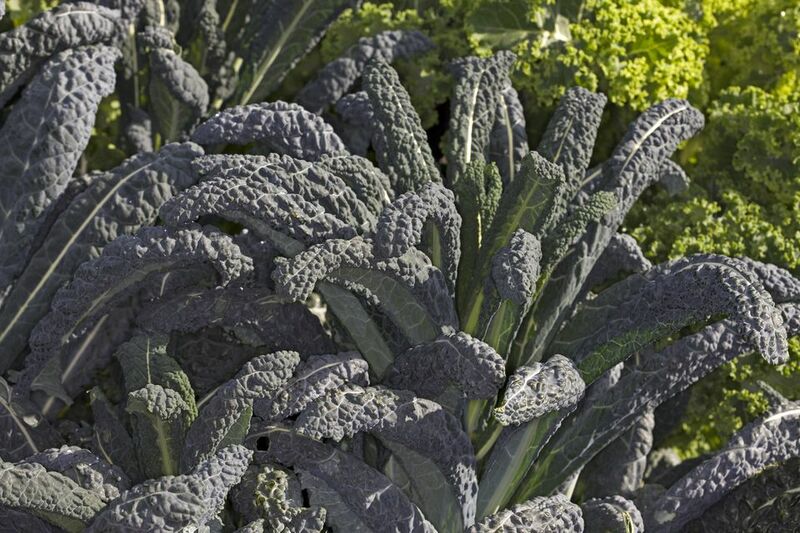 Though black-leaf kale appears in markets in November and continues through spring, it's at its best later in the season, when the leaves have felt the sting of frost, which brings out a pleasing sweetness. In purchasing it, you'll want leaves that aren't too long—beyond 18 inches (50 cm) the leaves begin to toughen, and taste sharper. The leaves should also be firm, and fairly evenly colored and shaped; darker areas are fine, but if you see paler green, brown, or yellow, or holes, think about buying something else. Once you get your kale home, you can store it for a day or two in the crisper section of the refrigerator, with the stem end wrapped in a moist paper or cloth towel to keep it from drying out. Don't wash it until you plant to cook it, because it may go limp. Come cooking time, wash it well. The ribs are edible, though they take much longer to cook than the leaves, especially if they're thick, and you might, therefore, want to remove them: fold the leaves lengthwise with one hand, grasp the exposed ribs with the other, and pull in opposite directions. Most recipes then have you cut the rib-less leaves into strips. Cavolo nero also freezes well. To freeze it, remove the ribs, cut the leaves crosswise into strips about 1/2 inch wide, and blanch in salted boiling water. Drain and rinse in cold water; then squeeze the water out and freeze the leaves in quart-size freezer bags, flattening them out to about 3/4 of an inch thick and laying them on a metal tray for quick freezing. The frozen cavolo nero can be easily used by slicing open the bag. This works perfectly in soups or reheated in broth and then served over toasted bread. Kale leaves can also be used as wrappers: Blanch them briefly in lightly salted water, then use them to wrap whatever filling you have in mind, for example cubes of cheese (then bake the rolls), shrimp or prawn tails (bake), fish filets (bake or braise), chicken breasts (bake or braise), or even something like risotto (braise).